Hasbro surprised everyone when they finally made Headmaster Arcee a reality! Released as an early availability figure at Hascon this limited edition re-tool of the Blurr/Brainstorm mould was released with an included Die-Cast Ultra Magnus Titan Master! There is actually a surprising amount of retooling done to this mould in order to differentiate it from the previous releases. All new upper arms and shoulders, a new nosecone, a unique Titan Master, and unique blaster pistols for accessories. Couple that with a striking pink and white paint job and you have a great looking Arcee figure to stand next to Hot Rod and Kup! Her articulation and transformation of course is the same as the previous figures using this body. That being said, all the joints and hinges on this figure are tight and perfectly toleranced. I found this to be the same with my SDCC exclusive Titan Hunter Brainstorm. Something happens when Hasbro sits down and spends time on these exclusives that really ups the fit and finish of the final product. I have only one complaint about this figure, and it is minor. The design for "Leinad", her Titan Master, causes some issues. The Titan Master has a strangely shaped conical head that is meant to emulate the helmet portion of Daniel's Exo-Suit. This looks great when he is on his own but it absolutely destroys the integrity of his connection as a head. Turn Arcee's head left or right and that Titan Master is falling off guaranteed. Not an issue for those who are displaying her but a bit frustrating when you are trying to achieve dynamic poses for photos. I highly recommend adding this figure to your Titans Return collection if you can. I don't think it's worth aftermarket/scalper prices, but if you can snag a set for under $30 it's absolutely worth the pick up! 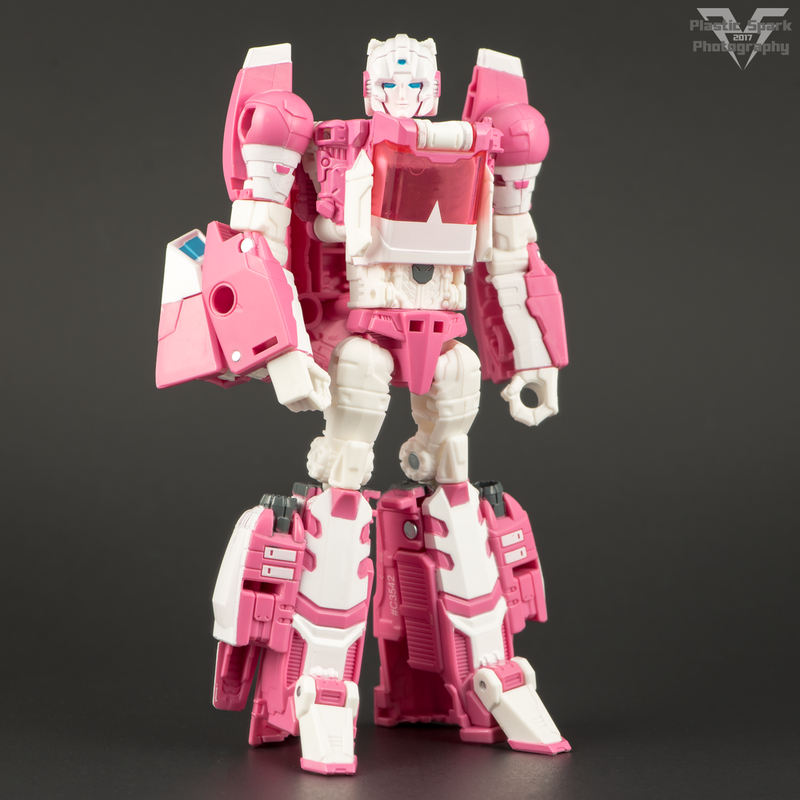 I will be adding some more photos to this gallery going forward but for now here's some shots that I've taken of Titans Return Arcee.